Discover an abundance of exquisite single halo engagement rings from classic 1920's styles to decadent modern pieces. Browse a varied collection featuring single, round, fancy shaped and multiple halo's surrounding a central certified diamond. Decide between halo rings with plain or diamond set shoulders, slim bands or wider designs. From the classic styling of the round halo setting to the alluring Marquise halo, we have almost every possible ring design in a wide selection of metal choices, including 950 Platinum, 18ct Gold and 950 Palladium. Discover the intense fire from the sparkling Cushion cut diamond engagement ring. Styled with an impressive double halo setting, this indulgent engagement ring sparkles with the addition of diamond set shoulders. Wedding ring friendly setting. Large choice of certified centre diamonds. Additional 0.50 carats of perfectly faceted F-G colour VS clarity round brilliant-cut diamonds in a double halo and along each Fishtail designed shoulder. Beautifully presented. Certification included. Worldwide delivery available. Decadent and indulgent, this exceptionally crafted double halo engagement ring features a sparkling Princess cut diamond, held above a double halo setting with the addition of dazzling diamond set shoulder diamonds. 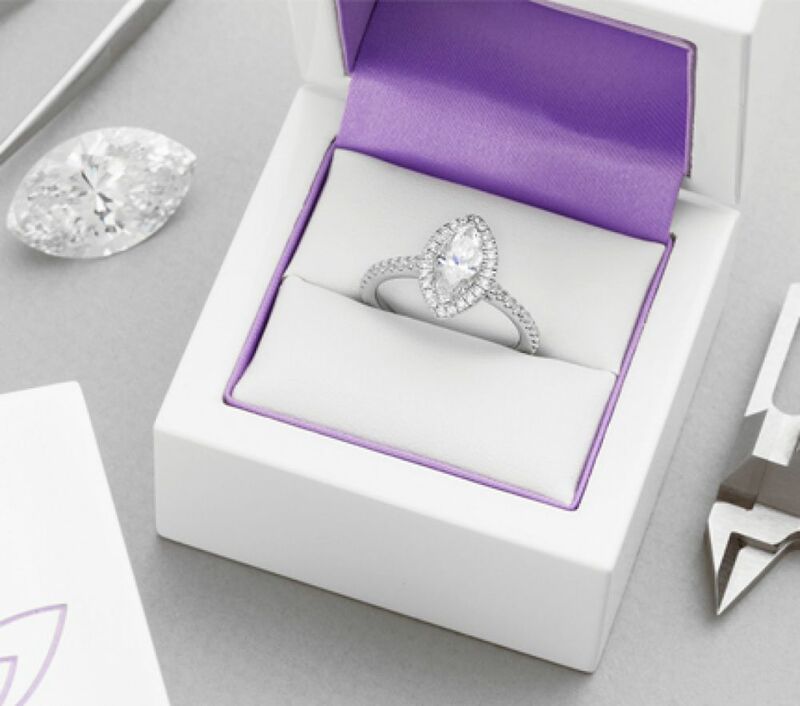 A choice of certified diamonds. Additional 0.50 carats of perfectly faceted F-G colour VS clarity round brilliant-cut diamonds in a double halo and along each Fishtail designed shoulder. Wedding ring friendly setting. Precision set and finished. Beautifully presented. Certification included. Worldwide delivery available. Octavia dazzles with a cushion shaped halo around a spectacular round-brilliant cut diamond. Styled with a wedding ring friendly setting this distinctive design can be crafted in a wide range of diamond and precious metal choices. Choose from a wide range of carat weights for your centre stone - from 0.25cts up to 2.00cts for the main diamond. We include an additional 0.20cts of diamonds to compliment within the halo. This elegant design is created within 3-4 weeks and benefits from a simple, wedding ring friendly fit. The band measures approx. 2.2mm in width and has a court ring profile. Choose your exact diamond quality for the finest round diamond halo ring with central 4 claw setting and diamond set shoulders. One of the most popular diamond halo ring designs. Set with a round brilliant cut diamond of your exact choice. Fully certified by GIA or IGI with a very good cut grade as minimum. Approximately 0.35cts of Halo and shoulder diamonds are then added and matched accordingly in this meticulously crafted design. Please allow 3-4 weeks for delivery on this design. Wood boxed as shown below with fully insured shipping from UK. Discover the Eclipse diamond engagement ring. Crafted with a choice of Cushion cut diamond, this unique halo engagement ring features an incredible Cushion cut diamond surrounded by a halo of brilliant diamonds and benefits from a wedding ring friendly setting in a wide choice of precious metals. Choose from a range of cushion cut diamond carat weights, colours and clarities. Full bezel setting. We include up to 0.30cts of additional 1.5mm round brilliant cut diamonds within the surrounding halo. This ring design benefits from a wedding ring friendly setting above tapering open shoulders with a court profile. Please allow approx. 3-4 weeks for completion of this design. Halo diamond engagement ring with central oval brilliant cut diamond and diamond set shoulders. Central oval brilliant cut diamond. Choose from a range of carat weight options for this centre stone. Additional 0.30cts of outer 1.3mm diamonds set across the halo and shoulders, matched by colour and clarity. Grain set shoulders. Wedding ring friendly design. Please allow 3-4 weeks for completion of this ring style. Unique round diamond halo engagement ring with alternating outer diamonds and wedding ring friendly setting Choose from a range of central diamond carat weights. Fully customise by metal choice, diamond colour and clarity. Choose from 0.30cts upto 0.80cts and we will provide an additional 0.20cts of halo diamonds within the ring matching your centre stone. Four claw setting, with elegant outer diamond halo composed of mixed 1.6mm and 1.3mm round brilliant cut diamonds. Please allow 3-4 weeks for this design to be crafted to your exact specifications. Exquisite halo design, bezel set diamond engagement ring, with diamond shoulders and wedding ring friendly styling. Choose your centre diamond for this simply elegant setting. We then provide an additional 0.40cts of diamonds set across the halo surround, and across the diamond shoulders. The ring design exhibits a fine 2.2mm wide band, with a court profile and each ring is delivered within approx. 4 weeks from placing your order. Elegant princess cut diamond engagement ring with a square diamond set halo surround. Central princess cut diamond, available in a range of carat weight options. Choose your central diamond weight. (Right) Additional 0.20cts of diamonds within the halo. Four claw setting. Round brilliant cut diamond set halo. Plain tapering shoulders. Wedding ring friendly setting. Available in 18ct white gold, Platinum and 18ct yellow gold and white gold combination upon request. Introducing the inspirational Solette cushion cut diamond halo engagement ring. Precision set with a halo of outer diamonds, this exceptional ring design features milgrain edging and luxurious diamond set shoulders. Total diamond weight guaranteed 1.00cts. Experience the deep scarlet red colour of a natural ruby set amongst a cushion shaped halo grain set with ice white round brilliant diamonds. Elegantly styled with a halo setting, we craft this ring design with a deep scarlet red ruby encircled by pristine white sparkling diamonds for contrasting beauty. Experience the intense blue colour of a natural sapphire set amongst a cushion shaped halo grain set with ice white round brilliant diamonds. Delightfully styled with a halo setting, we craft this ring design with an intense Royal blue sapphire encircled by pristine white sparkling diamonds for contrasting beauty. This exceptional Marquise diamond halo engagement ring features a beautifully cut Marquise diamond. A halo of round brilliant diamonds dazzles above precision set diamond shoulders. An exquisite ring design which benefits from a wedding ring friendly setting. Marquise brilliant-cut diamond. Surrounding grain set halo of round brilliant-cut diamonds. Diamond set shoulders. Wedding ring friendly setting. Approximately 2.5mm wide court shaped comfort fit band. Available in 18ct White Gold, 18ct Yellow Gold, 18ct Rose Gold, 950 Platinum and 950 Palladium. Beautifully presented and gift packaged. Available in many diamond quality combinations. 4 weeks delivery. The Maisie Emerald cut halo ring features a dazzling halo setting around an Emerald cut diamond within a wedding ring friendly setting. Central 0.50cts Emerald Cut diamond. 0.16cts of outer round brilliant cut diamonds within halo. Plain shoulders and wedding ring friendly setting. Fully certified central diamond. Please allow approx. 4 weeks for manufacture. Uniquely styled princess cut diamond halo engagement ring, with a range of diamond options, framed by a graceful diamond halo of round brilliant diamonds aligned north east south west. Uniquely styled ring design. Central princess cut diamond, held within a four claw setting. Choose your exact diamond carat weight colour and clarity. Set within a halo of 20 round brilliant cut diamonds, 0.15 carats in addition to the centre. North east south west aligned compass alignment. Tapered court profile band. Please allow 5-6 weeks for completion before shipping. Wood boxed and beautifully presented. Emerald cut diamond halo ring, with exceptionally pretty diamond halo and meticulously claw set diamond shoulders. Choose your central Emerald Cut diamond weight from the options box. Additional 0.25cts of melee diamonds across halo and shoulders to compliment this. Fully certified central diamond. 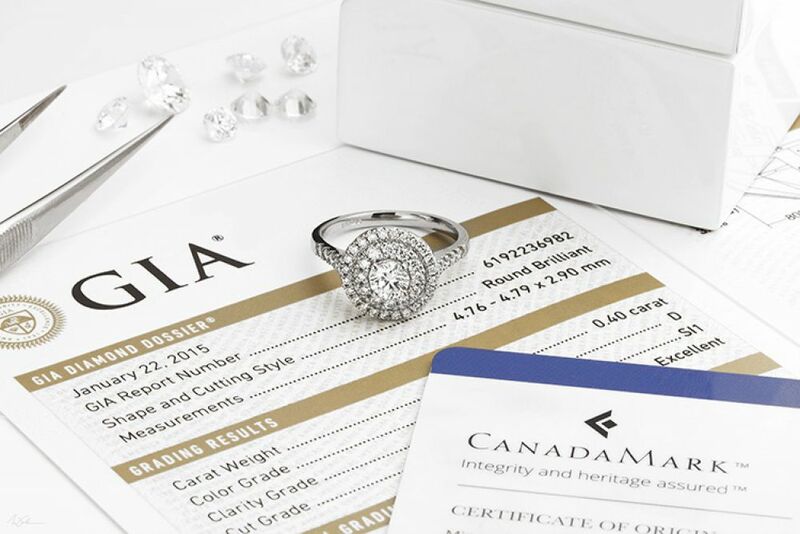 GIA or IGI certification as standard. Please allow 5-6 weeks for delivery of this ring design. Wood boxed and presented as shown below in our example. Pick your ideal diamond choice for this vintage inspired diamond halo ring with elegant milgrain detail, encrusted with diamonds. Once you have selected your chosen diamond, this will be accompanied by an additional 0.60cts of small diamonds for the halo and shoulders of this charming vintage inspired ring design. Migrain edging provides perfect detail to compliment the antique styling. Please allow 5-6 weeks for completion of this design. 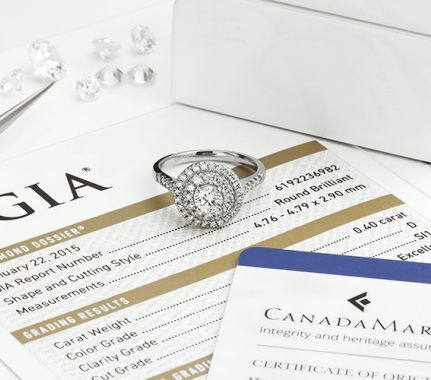 Full GIA, or IGI certification included with very good cut grade. Packaging as shown below. Select from an exceptional choice of diamond sizes for this plain shoulder diamond halo ring design with exceptional beauty. Having plain polished shoulders, this diamond halo engagement ring radiates beauty from the dazzling effect of the diamond halo surrounding a fully certified diamond of your own choosing. The design is fully wedding ring friendly and has a comfort fit to the band. Between 0.10 - 0.18cts (depending on central diamond size) of halo diamonds in addition to the central diamond chosen. Please allow 3-4 weeks for manufacture depending on your chosen options. Packaging example below for reference. An exceptional Princess Cut diamond engagement ring with border and grain set diamonds along the shoulders. 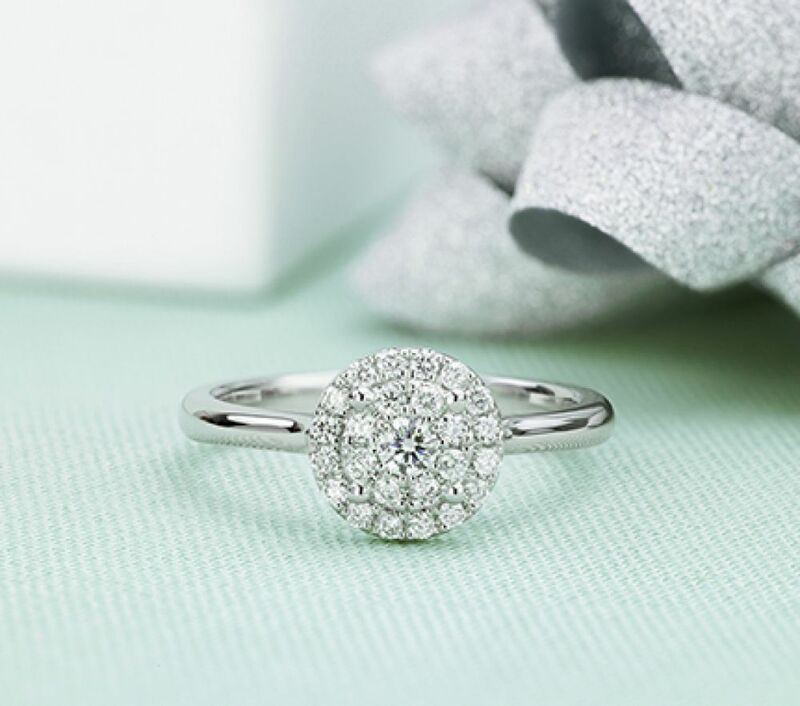 Created to your specified diamond quality, this elegant flower styled diamond halo ring is set with 3 different sized diamonds in a unique design. Beautifully flower styled diamond halo ring, adorned with 17 round brilliant cut diamonds. Firstly choose your metal and preferred centre diamond quality. In addition, the ring will contain an extra 0.30cts of round brilliant cut diamonds. We supply a GIA or IGI certified centre diamond with a minimum very good cut grade. Please allow around 5-6 weeks for completion before we ship from UK. Wood boxed as shown below. Uniquely styled diamond halo ring featuring a tiered double halo surrounding a certified central round brilliant cut diamond. Choose your perfect diamond from the options box. We set and additional 0.25 carats of matching outer diamonds within the twin tiered halo in addition to this. Court profile open shoulders rise towards the setting. Please allow 5-6 weeks for most combinations. This style is a beautifully refined design and a perfect compliment to the full diamond halo range. Wood boxed and gift packaged. This wonderfully elegant vintage design features a princess cut diamond with outer halo, diamond shoulders and elegant milgrain edging. Princess cut diamond. Octagonal Halo surround. Grain set diamonds. Double row diamond shoulders. Four claw Princess cut diamond. Available from 0.25cts upwards. Additional 0.27cts in the shoulders and halo. Choice of diamond colour, clarity and carat weight. Milgrain edges to halo and shoulders. Wood boxed and gift packaged. Approx. 5 weeks for delivery. An elegant diamond halo ring, accented with diamonds within a 'Tulip' styled crown pavé set with diamonds. Central round brilliant cut diamond. Following metal choice, choose your carat weight, diamond colour and clarity. Four claw setting, above a flower styled halo in an elegant vintage style. 5 small diamonds in each petal, pavé set. Available in 18ct White Gold and Platinum. Please allow approx. 5 weeks for delivery. Edwardian style vintage halo engagement ring with scalloped diamond set halo surround, and central round brilliant cut diamond in a four claw setting. Central round brilliant cut diamond - choose from carat weights 0.30cts to 0.90cts. Four claw setting. Edwardian styled vintage design. 0.08cts of outer round brilliant cut diamonds. Plain shoulders and court profile band. Please allow upto 5 weeks for delivery. Wood boxed and gift packaged. Legacy inspired emerald cut diamond halo engagement ring with diamond set shoulders. Inspired by designs like the Legacy style ring, this elegant emerald cut diamond halo ring holds a beautiful 0.60 carat emerald cut diamond measuring 6 x 4mm. The diamond is provided with full certification, from GIA or IGI and has an additional 0.30 carats of outer melee diamonds across both the diamond halo and shoulders of the ring. Wood boxed, and gift packaged and available within 5-6 weeks to produce. Choose your diamond for this oval diamond halo engagement ring with additional sparkle from 0.11 - 0.18 carats of round halo diamonds. Shown here with a matching wedding ring (available to order separately) this wedding-ring-friendly engagement ring design, holds your choice of diamond, within a matching encircling halo of outer diamonds. The halo carries an additional 0.11 - 0.18 carats of round brilliant cut diamonds above simple polished plain shoulders. Timescale is typically around 3-4 weeks. Beautifully presented wood boxed. Blue sapphire and diamond Vintage styled diamond cluster ring. Central round brilliant cut deep blue 1ct 6.5mm sapphire. Four claw setting within Vintage style ring. Substantial Platinum mount, set with surrounding round brilliant cut diamonds, 0.40cts in weight. G colour VS1 clarity. The single halo setting has risen dramatically in popularity - even within the last two years, but the origin of the halo setting dates back to the 1920's. Vintage halo styles have soared in popularity now merged with state of the art manufacturing techniques. Each diamond halo contains perfectly cut diamonds, fully faceted to add an extraordinary sparkle to each ring design. You will find many of our designs crafted with a wedding ring friendly setting—making them ideal for a proposal. All halo designs are completed in between 4 to 6 weeks, with Worldwide shipping available. 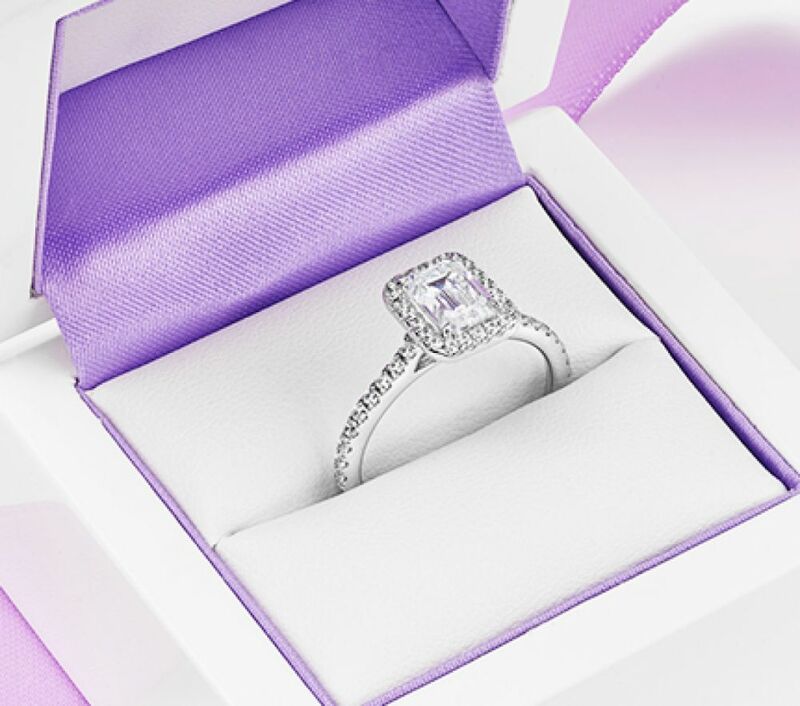 We present your finished ring beautifully in bespoke packaging, securely shipped by courier to your door.